Dario Saric‘s athleticism and versatility is earning him praise from the Sixers coaching staff and is setting the rookie forward apart from the other members of the team’s crowded frontcourt, Keith Pompey of The Philadelphia Inquirer writes. Kevin Garnett attending the Clippers‘ practice on Thursday and he worked with a number of the team’s big men, Jovan Buha of ESPN.com relays. “KG was phenomenal today,” coach Doc Rivers said of Garnett’s appearance. “This morning, before practice, he had a teaching clinic that you would pay a lot of money to see. It was great. It was great for Blake Griffin and [DeAndre Jordan] and the young guys as well. It’s great to have him around. He’s a great teacher. We know him as a great player. I knew him as a great teacher. He’ll be really good for us.” Garnett reportedly has been offered a coaching position with Los Angeles, as well as with the Cavs. Former Timberwolves general manager Milt Newton departed from the franchise last year, when Flip Saunders‘ passing led to an overhaul of the club’s front office and coaching staff. However, he remains interested in returning to an NBA front office, telling Marc J. Spears of The Undefeated that he wouldn’t be opposed to an assistant GM role. No teams have approached him about executive positions since his departure from Minnesota though, according to Milton. Former first overall pick Greg Oden has returned to Ohio State to finish working toward his college degree, a source tells Jon Rothstein of CBS Sports (Twitter link). While the former Trail Blazers center is in Columbus, he’ll also help out at Buckeyes’ practices, says Rothstein. Steve Kyler of Basketball Insiders lists six top basketball executives who could find themselves on the hot seat at some point in the not-so-distant future if their respective teams don’t play well in 2016/17. With training camps around the NBA having gotten underway this week, Bobby Marks of The Vertical delves into the training camp contract, explaining how they work and how different language in deals affects a players’ preseason earnings and injury protection (or lack thereof). The Lakers‘ signing of Timofey Mozgov has received plenty of criticism this offseason, but Los Angeles won’t be the only team with buyers’ remorse this fall, according to Mitch Lawrence of Forbes.com, who identifies five other clubs that may come to regret their summer deals. SEPTEMBER 30th: The signing is official, the team announced. SEPTEMBER 29th: P.J. Hairston will join the Rockets on a training camp deal, Adrian Wojnarowksi of The Vertical tweets. Houston will hold his D-League rights, Wojnarowski adds. A 2014 first-round pick, the 6’6” small forward played for both the Grizzlies and Hornets last season. He was acquired by the Grizzlies in a deadline deal in which guard Courtney Lee landed in Charlotte. He started half of the 18 games he played for Memphis last season, averaging 6.9 points and 2.6 rebounds in 20.8 minutes. He started 43 of the 48 games he played for Charlotte, averaging 6.0 points and 2.7 rebounds in 19.5 minutes. Hairston has shot just 34.3% from the field in 111 career game. Hairston recently worked out for the Nets and Pacers before the Rockets offered him a deal. He also attended the Lakers’ mini-camp for free agents in August. “It’s funny how things change. All I have right now associated with basketball are my friends and memories. And I’m so thankful for those things. I remember just a few years ago when the Big 3 were together and we were having a ball playing the game we love with some of the most professional, talented guys the NBA has ever seen. I remember the fans of Miami coming out to see the show every night. The love, the compassion and the energy we felt was second to none. I want to thank the city of Miami from the bottom of my heart because things may change but the good times will last forever in my memories. Thank you! With an October 1 deadline looming for Donatas Motiejunas and the Rockets, it doesn’t appear the two sides are closing in on a long-term deal. According to Adrian Wojnarowski of The Vertical (via Twitter), Motiejunas the Rockets aren’t currently negotiating, though Wojnarowski cautions there’s still time for the two sides to re-engage. Motiejunas received a qualifying offer worth $4,433,683 from the Rockets this summer, which gives Houston the right of first refusal, preventing the forward from signing outright with another club. The Lithuanian big man, who turned 26 this month, could sign that one-year qualifying offer and become an unrestricted free agent next summer, but he would likely prefer some longer-term security and a bigger payday. Earlier in September, Motiejunas’ agent B.J. Armstrong publicly expressed some concern with the situation, telling Calvin Watkins of ESPN.com that the Rockets have yet to make a serious contract offer for his client. According to Armstrong, October 1 will be the moment of truth for the Rockets and Motiejunas, with resolution expected to come by that point. October 1 is the deadline for Motiejunas to accept his qualifying offer. After that point, he remains a restricted free agent, but he’s no longer able to sign that $4.434MM QO that was on the table for the previous three months. So if the Rockets don’t offer him a deal he likes in the very near future, Motiejunas will likely take the QO and focus on unrestricted free agency in 2017. If he signs the QO, he’d also gain the ability to veto any trades involving him this season, which could come in handy, considering the Rockets nearly moved him at the 2016 trade deadline. We’ve already rounded up all of the players whose 2016/17 salaries aren’t fully guaranteed, sorting them by position. To get a better sense of which players might avoid being waived before the regular season though, it’s helpful to take a look at the non-guaranteed contracts by team. Below, you’ll find a team-by-team breakdown of the players whose salaries for ’16/17 aren’t yet guaranteed. Unless otherwise noted, these players are on minimum-salary contracts. Players with partial guarantees have their guarantees noted in parentheses. For details on which players will have their salaries guaranteed prior to the league-wide salary guarantee deadline of January 10, be sure to check out our schedule of salary guarantee dates. Salary information from Basketball Insiders was used in the creation of this post. Over the next several weeks, Hoops Rumors will be breaking down the 2016 offseason for all 30 NBA teams, revisiting the summer’s free agent signings, trades, draft picks, departures, and more. We’ll evaluate each team’s moves from the last several months and look ahead to what the 2016/17 season holds for all 30 franchises. Today, we’re focusing on the New York Knicks. Joakim Noah: Four years, $72.59MM. Courtney Lee: Four years, $48.003MM. Lance Thomas: Four years, $27.55MM. Fourth year non-guaranteed. Mindaugas Kuzminskas: Two years, $5.773MM. Brandon Jennings: One year, $5MM. Marshall Plumlee: Three years, minimum salary. Second and third years non-guaranteed. Maurice Ndour: Two years, minimum salary. Second year non-guaranteed. Lou Amundson: One year, minimum salary. Sasha Vujacic: One year, minimum salary. Willy Hernangomez: Four years, $5.865MM. Fourth year non-guaranteed. Acquired Derrick Rose, Justin Holiday, and the Bulls’ 2017 second-round pick from the Bulls in exchange for Robin Lopez, Jose Calderon, and Jerian Grant. Hired Jeff Hornacek as head coach to replace interim head coach Kurt Rambis. Rambis retained as associate head coach. Signed Amar’e Stoudemire to a ceremonial contract so he could retire as a Knick. Check out our salary cap snapshot for the New York Knicks right here. The Knicks entered the offseason as a franchise at a crossroads, needing to choose between hitting the reset button and building around Kristaps Porzingis, or attempting to maximize Carmelo Anthony‘s few remaining productive seasons by adding veterans who could step in and contribute immediately. Team president Phil Jackson chose the latter, adding a number of talented players who have the potential to help New York return to the postseason, but carry with them significant injury concerns. Are the Knicks a better team on paper than a season ago? Absolutely. But just how many games the team can expect to get out of the trio of Derrick Rose, Brandon Jennings and Joakim Noah remains to be seen. New York made its biggest strides as a team this summer by improving on its woeful backcourt of a season ago. 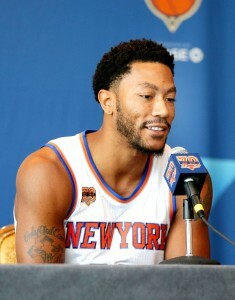 The addition of Rose is a gamble that could pay off significantly for the team if the 27-year-old can remain healthy. This is obviously not a given, considering he has averaged just 33 games per season over the last five campaigns. Given his track record, not to mention the grind of back-to-back games that take a terrible toll on players, it isn’t realistic by any means to expect Rose to play in 82 contests. But if he can be a semblance of his former self for 60 to 65 games, which I believe is a realistic target, then Jackson’s gambit of acquiring him in a contract year may end up working in the short term. With Rose as the starter, the Knicks will need depth at the point — not just in the event that disaster strikes, but to allow him to sit out the occasional game to rest. This is where things get a bit frightening for fans of the team. While I love the addition of Jennings, especially at the bargain price of $5MM for one year, he’s coming off of a ruptured Achilles tendon and is no sure bet to avoid sitting behind the bench in street clothes for stretches of the campaign. The only other point guard currently on the roster is undrafted rookie Chasson Randle, who is probably better suited to log minutes in Westchester for the team’s D-League affiliate this season than in Madison Square Garden. If the franchise is serious about making a playoff push this season, it should seriously consider signing Mario Chalmers or Norris Cole, the two top remaining free agents at the position. If Sasha Vujacic ends up becoming the fallback option as playmaker, ‘Melo may end up regretting not pushing for a trade this summer. For the second summer in a row, Jackson added a shooting guard via free agency. Last year’s signing of Arron Afflalo failed miserably, with the team essentially pushing him out of MSG, shutting the doors, changing the locks and turning off lights once he opted out of his deal. Courtney Lee should be a much better fit for New York than Afflalo was, especially if new coach Jeff Hornacek is given free reign with the offense and not forced to stick with the triangle as his predecessors, Derek Fisher and Kurt Rambis, were. Lee’s solid defense and three-point shooting will be a boon to the team, though inking the 30-year-old to a four-year, $48MM+ deal is a bit of a gamble given his career scoring average of 9.6 PPG. Speaking of risks, the signing of Noah to a four-year, $72MM+ pact is perhaps the biggest roll of the dice this offseason for Jackson. There’s no denying that Noah, when healthy, can impact the game on both ends of the court. The 31-year-old is almost assuredly going to become a fan favorite in New York, but he has only averaged 63.5 games per season during his nine-year NBA career, and big men don’t generally grow more durable once they reach their 30s. This contract not only has the potential to become an albatross around the Knicks’ necks; it could negatively impact the development of Porzingis, whose best position may ultimately be at center. Anything that could have an adverse effect on the second-year player and potential superstar is a bad thing for the franchise. It’s in no way a given, but if the majority of their players can remain healthy this season, the Knicks should improve upon the 32 wins they notched in 2015/16. Still, I’d be wary of expecting too drastic an improvement, as the eight seed and 40-42 wins seems like a favorable scenario for New York this year. With Rose and Jennings each only signed for one year, it’s possible the franchise will find itself rebuilding and/or retooling in 2017. If that’s the case, Jackson needs to look in the mirror and ask himself if making the Knicks a borderline playoff contender this season was worth not tearing down the team and starting anew. Of course, the Zen Master could be gone next summer, since he has the ability to opt out, leaving the cleanup to someone else. By that time, Anthony will be a another year past his prime and will hold less trade value than he did the past two seasons. It’s been 43 years since the Knicks won an NBA title, and it may be a few more years before fans have another legitimate shot at cheering for a champion. A year after the Cavaliers and Tristan Thompson took contract negotiations down to the wire, the team is once again engaged in a standoff with a key free agent. This time around, it’s J.R. Smith who remains unsigned, despite the fact that the Cavs have made him an “incredibly competitive and aggressive” offer, according to general manager David Griffin. While the two sides are still expected to reach an agreement eventually, count LeBron James among those who isn’t thrilled about the fact that there’s no resolution yet. Speaking today to reporters, including Joe Vardon of Cleveland.com, the Finals MVP said he hates “having to deal with this s–t again” during training camp, adding that “it wouldn’t be good for any side” if the Cavs and Smith don’t work something out. While LeBron suggested he’s not involved in negotiations at all, his praise for Smith suggests he wants to see his teammate gets paid, and his comments today may be designed to nudge the Cavs toward increasing their offer a little. According to Vardon, the club’s offer to Smith, which he rejected, was somewhere between $10-11MM annually. The veteran guard was reportedly seeking $15MM per year earlier in the offseason. Smith, who turned 31 this month, started a career-high 77 games for the Cavs during the 2015/16 season, and also started all 21 of the team’s playoff games. During the season, he averaged 12.4 PPG and shot 40.0% from long distance, making 2.6 threes per game. He increased those three-point numbers to 43.0% and 3.1 per game during the postseason.